Who Else Uses the Willamette? There are seven years left in the development of the Willamette Water Supply Program. Roughly halfway through a massive $1.2 billion project creating an additional water source for cities across Washington County, including Hillsboro, officials say it’s still on track to go live in 2026, and the next few years will see lots of construction in the region. 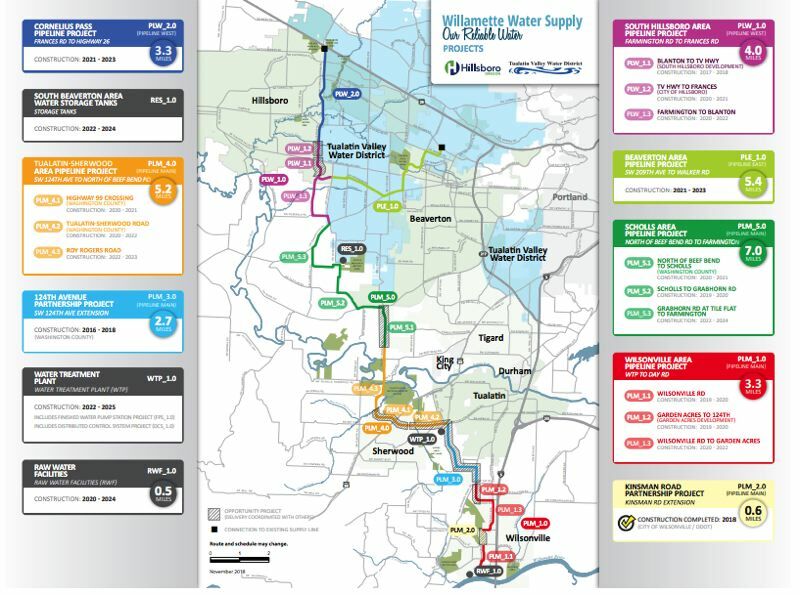 COURTESY PHOTO – A map and schedule of planned projects within the new water system development. Since 2012, the Tualatin Valley Water District and the city of Hillsboro have been partnering to build the Willamette Water Supply System, which will draw in water from the Willamette River near Wilsonville through a new pipeline system to Hillsboro. It’s an effort to increase water supply for the projected growth Hillsboro and neighboring cities are expecting to see in the next couple decades, an opportunity for Hillsboro to have more than one water source — which most surrounding cities do — and it’s a seismically resilient water system, TVWD media and community relations coordinator Marlys Mock said. Coordinators are proud of the work they’ve done up to this point, Mock said, with 96 percent of the money spent on the project so far spent locally, all completed construction done by local contractors, and with minimal disruption construction-wise, coordinating with local jurisdictions to build the pipeline at the same time as road projects, lessening traffic and construction impacts and reducing project costs. “(The project) has been broken up (into sections) partly because of jurisdictional boundaries, but also so that local contractors would have an ability to bid and win the work,” Mock said. “We didn’t want such an enormous project that it would take an international company to do, and so that effort has worked because so far all of our contractors are local. The pipeline will run through South Hillsboro — from Southeast Blanton Street to Tualatin Valley Highway, to Southeast Frances Street and Southwest Farmington Road to Southeast Blanton Street — with some of that portion of the project’s construction already underway. Project managers were able to coordinate with the new construction happening in South Hillsboro, building the pipeline at the same time the major parts of construction take place, Mock said. More local construction, including the Cornelius Pass Pipeline Project from Southeast Frances Street to Highway 26, is expected to begin in 2021 and be completed in 2023, according to the project map. The additional water supply will serve well for the region’s future, Mock said. Mock said other cities, including Beaverton, are likely to join in on the partnership. But whether they choose to or not, the water system will serve as an emergency backup for them. The president’s annual State of the Union address is often seen as a formal, serious affair, but in the Hillsboro Civic Center on Tuesday night, surrounding by bicyclists, plenty of jokes and a parody video of Billy Joel’s “We Didn’t Start the Fire,” Hillsboro Mayor Steve Callaway’s annual State of the City was anything but. Callaway, who has served as Hillsboro’s mayor since 2017, said the annual address is meant to be a celebration of the city’s accomplishments, and a look toward the future. Callaway outlined a number of accomplishments the city achieved in 2018, touching everything from transportation to sustainability. In a city where more than one-quarter of the population is non-white, the city has launched a plan to bring more cultural arts to the city, and purchased children’s books for its city libraries in seven new languages. It launched a Spanish-language city newsletter and continued its mission to engage the community through its Civic Leadership Academy, which works to prepare residents to serve on city boards and commissions. City Councilor Beach Pace is the first graduate of the program to be elected to the Council. Callaway said the city is working to be more inclusive and engage with diverse community members. “We’re taking the time to get it right,” Callaway said. Water rates will rise by up to 20 percent for some of Hillsboro’s businesses, and by smaller amounts for single-family residential households, starting in 2019. The Hillsboro Utilities Commission approved rate increases for the New Year, the city announced this week. Increases will also affect water customers in Cornelius, Gaston and the L.A. Water Cooperative in Laurelwood, which buy their water wholesale from Hillsboro. The rate increases vary by customer class. The largest increase is for irrigation, which will see a 20 percent hike. Multi-family residential, commercial and public entities will shoulder a 14.7 percent increase — more than 4 percentage points less than what was originally proposed, as the commission decided on a somewhat smaller increase “after receiving input from Hillsboro community members during the rate setting process,” the city stated in a news release. Increases for single-family residential, nonprofit and industrial customers will stay in the single-digit percentages. Single-family residential customers will see a 5 percent increase, nonprofits will experience a 6 percent increase and industrial water bills will go up by 8.5 percent. The typical single-family residential customer will see their bill increase by about $1.61, according to the City of Hillsboro. The water rate increase is greater for Hillsboro’s wholesale customers. Cornelius’ water rate increase is approved at 9.2 percent. Gaston and Laurelwood will get a 10.9 percent bump in rates. The new rates will become effective Feb. 1, 2019. For years, partners have been preparing to transform this reach of Chicken Creek. In 1996, thanks in part to the grassroots support of Friends of Tualatin River National Wildlife Refuge, the US Fish & Wildlife Service purchased the surrounding land and initiated restoration efforts. In 2009, a half-mile upstream from the refuge, neighbors on Green Heron Drive began working with the City of Sherwood, contractors, and other partners to enhance the creek near its crossing with busy Roy Rogers Road. Since 2017, the US Fish & Wildlife Service has been creating opportunities for volunteers to do hands-on creekside restoration near the southern edge of the refuge. More recently, partners embarked upon a long-awaited project that will realign Chicken Creek to its historic path, embracing the role that beavers can play in the placement of woody debris and revegetation. Project steps include modeling and excavating the historic path of the creek; rerouting and filling in the current channel; removing invasive species and replanting native vegetation; reestablishing a creek connection to the floodplain; and beginning long-term monitoring. WIFIA funding will save ratepayers about $383 million in borrowing costs for the new water system. The U.S. Environmental Protection Agency announced last week that Tualatin Valley Water District (TVWD) and the City of Hillsboro are eligible to apply for $616.6 million in federal loan support for the Willamette Water Supply System (WWSS) through the Water Infrastructure Finance and Innovation program (WIFIA). This is a remarkable success as the EPA selected only 39 proposals nationwide this year. The $1.2 billion investment in the WWSS will not change. However, WIFIA funding will save ratepayers about $383 million in borrowing costs for the new water system. Creating and funding the WIFIA program has been one of Senator Jeff Merkley’s highest legislative priorities since 2013. Senator Wyden, and Representatives Suzanne Bonamici, of Washington County, Earl Blumenauer, Kurt Schrader and Peter DeFazio each lent their support at critical legislative moments to make WIFIA a reality. The WIFIA program encourages local investments in water and wastewater capital improvements across the country by offering long-term low interest rate financing with flexible draw down and repayment options. The teamwork in Washington, D.C., mirrors the remarkable level of local cooperation at the heart of WWSS — the TVWD/Hillsboro partnership. TVWD and Hillsboro have long been partners in our regional Joint Water Commission, which operates a water treatment plan that provides 365,000 people with water today. As the two organizations searched for a future water supply, it became evident that working together was the way to go. The result is the WWSS which, once built, will serve our region well into the next century. WWSS will draw water from the Willamette River at Wilsonville, pump it to a new water treatment plant near Sherwood, and then distribute the water to TVWD, Hillsboro, and Beaverton customers. More than 30 miles of 66-inch diameter pipeline will be installed with water flowing to customer taps in 2026. The new system has many benefits. It will be a highly reliable water supply for our growing region. The system has been designed to withstand a major Cascadia Subduction Zone earthquake, speeding the region’s recovery after a large natural disaster. And, the state-of-the-art treatment plant will help protect us from contaminants such as algal toxins that result from our changing climate. In addition to household water needs, the new system will support the region with reliable water service for fire protection and economic development. We are already seeing the benefits of the smart planning at the core of WWSS. The newly built 124th Avenue extension, linking Sherwood and Tualatin to Wilsonville, is an example of how the WWSS communities and Washington County are working together to save money and reduce impacts to residents and the environment. The county and WWSS worked cooperatively, so the WWSS pipeline could be installed before the new road was built. WWSS has also cooperated with Wilsonville and Hillsboro transportation projects. More cooperation is coming when the county tackles Tualatin-Sherwood Road, Roy Rogers, and other projects over the next few years. The WWSS is also contributing to our local economy. To date, WWSS has spent $80 million with 96 percent of this spending going into local businesses. The Westside Economic Alliance works hard to sustain the economic vitality of the region. We do this by supporting the people, companies, and governments who do the hard work every day to protect and strengthen our communities. The core value of WWSS is long-term reliability. What we see in WWSS is how our entire community, from those who represent us in Washington D.C. to those serving us in local governments, can be relied upon to work together to achieve very big things. Norm Eder serves on the Executive Committee and Board of Directors for the Westside Economic Alliance and is also a past president of WEA. PORTLAND, OR – Oregon’s U.S. Senators Jeff Merkley and Ron Wyden, with Representatives Suzanne Bonamici, Earl Blumenauer, and Kurt Schrader, today announced that a massive $616.6 million loan, made possible through special federal funding from the Water Infrastructure Finance and Innovation Act (WIFIA), will be made available to the Tualatin Valley Water District and the City of Hillsboro. The financing will save ratepayers in the Willamette Water Supply System hundreds of millions of dollars in financing costs for the drinking water system that is under construction to deliver water to the agencies by 2026. “Having access to clean drinking water is extremely important and this is another opportunity for Oregon to lead the way,” Blumenauer said. Through the U.S. Environmental Protection Agency (EPA), partners in the Willamette Water Supply System will be able to apply for up to $616.6 million in WIFIA financing support. The WIFIA financing, once completed, will save Tualatin Valley Water District and City of Hillsboro ratepayers approximately $383 million in repayment costs. The new drinking water delivery system—including its intake, over 30 miles of pipes, water treatment plant, and two storage reservoirs—will serve 400,000 residents and businesses in Washington County. The $1.2 billion system is being built to the highest seismic safety standard to recover quickly after a major earthquake. To date, 96 percent of the project’s expenditures, over $80 million, have been spent in the local economy. The WIFIA program was created by Merkley in 2014, signed into law in December 2016. Merkley fought to create the WIFIA program after hearing directly from Oregon community leaders, including those in Washington County, about the lack of low-cost financing options for critical water infrastructure upgrade and repair projects. Last year, the competitive program selected 12 projects for loans, including the Willamette Water Supply System project. The WIFIA credit assistance allows the Tualatin Valley Water District and City of Hillsboro to lock in financing savings at today’s low rates for the duration of the entire program. And, unlike commercial bond transactions, payments on borrowed funds do not begin until funds are taken, adding to the savings for ratepayers. Congressional delegation announces $617 million toward $1.2 billion program to provide supplies to Washington County communities by 2026. Oregon’s congressional delegation has announced a $617 million federal loan that will enable the Tualatin Valley Water District and several cities to obtain water from the Willamette River. The loan from the Environmental Protection Agency will allow the Willamette Water Supply Program to deliver water to the affected areas by 2026 and save an estimated $383 million in financing costs. Participating cities are Beaverton, Hillsboro, Sherwood, Tigard, Tualatin and Wilsonville, plus Washington County and the Tualatin Valley district. When completed, the $1.2 billion system will allow them to tap a total of 60 million gallons per day and provide water even if a severe earthquake off the Oregon coast disrupts their current supplies. The loan will be repaid by water customers of the participating agencies. The announcement was made Friday, Nov. 2, by Sens. Jeff Merkley and Ron Wyden, and Reps. Suzanne Bonamici, Earl Blumenauer and Kurt Schrader, whose districts cover the Portland metropolitan area. Merkley was the chief advocate for the 2014 Water Infrastructure Finance and Innovation Act, under which the loan was among 12 approved nationwide. The law was signed in December 2016; this is the second year that projects have been funded. “Oregon’s leaders — including those in Washington County — deserve a tremendous share of the credit for this progress. Their persistence in brainstorming solutions ultimately led to the creation of this program,” Merkley said in a statement. Merkley referred to complaints by local officials about the lack of low-cost financing options to pay for large-scale water and sewer improvements. The loan enables the Tualatin Valley Water District and Hillsboro to lock in lower loan rates for the duration of the project. Unlike commercial bonds, loan repayments start only after the agencies draw the money. 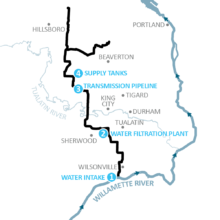 Among the program’s features: Improvements in intakes from the Willamette River, a new treatment plant at Wilsonville, more than 30 miles of pipeline and two reservoirs. The announcement drew praise from Hillsboro Mayor Steve Callaway and the Tualatin Valley Water District board. Also during the work session, Willamette Water Supply Program coordinators provided an update on a project that will implement a 30-mile water pipeline from Wilsonville to Hillsboro. The project will provide more water for jurisdictions such as Hillsboro and Beaverton while Wilsonville will also add 5 million gallons per day. Wilsonville will invest $125,000 in construction costs for the project and be paid $17 million in prepaid rents by 2026 for the hassle of construction to the community. The first part of the project in Wilsonville, which is slated to begin and end in 2019, would place the pipe along Kinsman Road from the east side of S.W. Arrowhead Creek near the Willamette River Water Treatment Plant and then stop a few hundred feet across Wilsonville Road. WWSP staff are still working on a traffic plan for construction at the Wilsonville Road crossing. WWSP wants to finish this phase before the Fifth Street-to-Kinsman Road extension is completed. The second phase of the project, which is slated to start in 2019 and end in 2020, would run the pipe along S.W. Garden Acres Road from S.W. Ridder Road to S.W. Day Road. And the last phase would include construction from S.W. Boeckman Road to S.W. Ridder Road along S.W. 95th Ave. as well as along Kinsman Road between Wilsonville Road and S.W. Barbur St. This project is scheduled to begin in 2020 and finish in 2022. The second phase of the project, which is slated to start in 2019 and end in 2020, would run the pipe along S.W. Garden Acres Road from S.W. Ridder Road to S.W. Day Road. We often take for granted our ability to turn on a kitchen faucet and have clean water flow. Fortunately, we live in a part of the world where running water is readily available. I was amazed to read recently that 2.1 billion people worldwide lack access to safely managed drinking water — this is according to the United Nations. Here on the Westside, those who manage our water are thinking and planning ahead to secure a new source for our water supply. The Willamette Water Supply Program is a partnership between Tualatin Valley Water District and the City of Hillsboro, and will develop the mid-Willamette River at Wilsonville as an additional water supply source. This new system will run water from Wilsonville towards Cooper Mountain in Beaverton and out to Hillsboro — more than 30 miles. It’s expected to be up and flowing by 2026 and will provide an additional reliable water supply for the region. It will also help water system operators balance the water supply during times of drought or other interruptions. It is going to offer us the opportunity to recover more quickly after a large natural disaster. Management of the project has also been fiscally responsible as leaders look to coordinate with partners like Washington County (a public sector member of Westside Economic Alliance). When it’s possible, the water supply staff have planned the pipeline to be laid or connected at the same time as other road construction projects, such as the 124 Avenue extension in the Tualatin, Sherwood, and Wilsonville area. It would include being part of new areas of development, like in South Hillsboro. By partnering with these sites where construction is planned or already underway, residents will experience far less construction impact in their area, and it saves ratepayers money too. Construction will peak between 2021-2024 in completing the 30 miles of seismically resilient large-diameter pipeline, reservoir tanks and water treatment plant. The estimated overall cost is expected to be $1.2 billion with most of the cost earmarked for planning, engineering, construction and real estate. The early leadership goals and the mission statement helped guide the development of the water supply program to emphasize the importance of keeping the project local. The individual construction projects are purposefully “bite-sized” so local contractors and talent can bid, win and successfully complete the projects. This effort has been successful thus far, with more than 90 percent of all the project funds spent in employing local firms, construction companies, and others. According to the program’s newsletter, more than 100 local businesses have provided goods and services for the program, contributing about $58.8 million to the local economy. “It is exciting to work on a local project that will have a lasting impact on our region,” said Frank Angelo, owner, of Angelo Planning Group. “DEA is proud to participate in the planning of the Willamette Water Supply System that will provide water to the westside for the next 100 years,” said Gavin Oien, VP of David Evans & Associates. 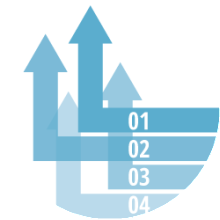 At Westside Economic Alliance, our mission is to ensure the economic vitality of the region. This creatively planned project will provide future water resources for economic growth, and the construction phase of it ensures business opportunities and employment for local providers in Washington County. Locals say cities are working to protect the region, but a massive quake will still cause havoc. The “Big One” will devastate the Portland area even more than scientists expected, according to a new state geologists’ study of how a major earthquake will affect the tri-county area. The study, released Thursday, March 15, found that a magnitude 9 earthquake centered off the Oregon Coast in the Cascadia Subduction Zone would cause tens of thousands of casualties in the Portland area, displace tens of thousands of residents from their homes, and cost tens of billions of dollars in building damage. Virtually all of western Washington County’s population centers are within an area shaded red — the second-highest level of danger — on a risk map released along with the study by the Oregon Department of Geology and Mineral Industries. The study estimates Hillsboro would be second only to Portland among cities in the metro area in forecast damage from a major Cascadia earthquake. Depending on whether the magnitude 9 offshore quake occurs during the daytime or the nighttime, there could be as many as 7,700 casualties in Washington County alone, the study warns. Up to 121 people could die immediately in an earthquake in Hillsboro, according to the study. In Forest Grove and Cornelius, the study estimates about 41 dead between the two cities. As many as 14 percent of buildings could be total losses in the county, with the cost to repair damaged buildings estimated between $7 billion and $11.6 billion in today’s dollars. Across the county, up to 37,700 people could be displaced for an extended period, according to the study. In the tri-county region, the estimates for long-term displaced range from 16,800 to 85,300. Casualties, damage and displacement are expected to be higher if the soil is saturated — in other words, if it has been raining and the ground is soft, as it is for much of the year in northwestern Oregon. An earthquake that strikes during the day is expected to be deadlier as well. The top end of estimates represents the worst-case scenario, in which the soil is saturated and the quake hits during daytime hours. While the eastern end of the region, including the Gresham area, is not expected to be as hard-hit as Portland and its Westside suburbs, damage is still forecast to be widespread as far as the Cascades. “Although damage estimates vary widely throughout the study area, no community will be unharmed,” the authors concluded. Recovering from a Cascadia earthquake won’t be just a matter of putting out fires and stemming floods. There will be region-wide challenges to restore power, bridges and freeways, provide emergency medical care and assure food and water can be delivered. It will take months just to inspect homes and other damaged buildings to see if they are safe. Meanwhile, many will have to find other shelter, and some work places will have to be closed or relocated. The Forest Grove Sustainability Commission, which advises the Forest Grove City Council on environmental issues, recently held an event at which Stacy Metzger dispensed earthquake preparedness advice. Metzger volunteers as the “Map Your Neighborhood” coordinator for Forest Grove Fire & Rescue. “For Forest Grove alone, the prediction is an earthquake of this size would create $496 million in property damage, 2,200 people in need of shelters, nearly 600 injuries (142 of which would require hospitalization), and 36 fatalities,” Forest Grove Fire & Rescue reported on its official Facebook page, listing some of the projections for the city from the state geologists’ study. “This is a good wake-up call, and it is even more reason to get prepared for a large earthquake,” Metzger said Monday. Metzger has two degrees in geology and spends a lot of time thinking about earthquake preparedness. But even she can’t predict what an earthquake will look like in her community of Forest Grove when it hits. “I just say be prepared for the worst, and then you’re prepared for everything or anything, big or small,” she said. Washington County and the Oregon Office of Emergency Management urge residents to be “two weeks ready,” keeping a two-week supply of necessities on hand in case of a major earthquake that cripples infrastructure and disrupts the transportation network. But Metzger encourages anyone who might find a two-week requirement daunting to start out by building a three-day kit. As she pointed out, you can always add to it later. Hillsboro city officials have been preparing for a major earthquake for years, according to Tammy Bryan, emergency manager for the Hillsboro Fire Department. When Hillsboro built its new city hall, the Hillsboro Civic Center, in 2005, it was built to withstand a major earthquake. Likewise, the city’s major construction project building a new water supply line from Wilsonville to Hillsboro, is being built to keep water pipes intact, even during an earthquake. “While the threat of an earthquake may seem daunting, making a plan and identifying things you can do now to prepare can significantly reduce injuries and property damage,” the city wrote on its website about earthquake preparedness. In the event of an earthquake, city services, such as police and fire, will likely be busy, so officials warn residents to prepare to deal with emergencies until help arrives. In addition to planning emergency kits, city officials urge residents to make homes “earthquake safe” by bolting down and securing water heaters, refrigerators, furnaces and gas appliances, and repairing leaky gas lines and fastening shelves, mirrors and large picture frames to walls. The new study shows more severe impacts than previous estimates. But it didn’t bring any surprises or point to any new prevention efforts that haven’t been considered before, said Dan Douthit, spokesman for the Portland Bureau of Emergency Management. Emergency planners still will focus on the region’s greatest vulnerabilities, including more than 1,600 unreinforced masonry buildings in the city of Portland. Many of the buildings in Forest Grove, one of the region’s oldest cities, feature unreinforced masonry as well. But the new study, using more sophisticated Hazus software developed for the Federal Emergency Management Agency (FEMA), enabled scientists to drill down to damages at the neighborhood level as never before. The software is being constantly refined, incorporating real-world experiences from floods and earthquakes taking place around the world. That enabled scientists to calculate the number of deaths, life-threatening injuries and hospitalizations that will occur in different neighborhood clusters in Portland and cities around the tri-county area. Scientists now calculate there have been at least 40 large-magnitude earthquakes over the past 10,000 years along the 600-mile-long Cascadia subduction zone off the coasts of Oregon, Washington and Northern California. The most recent one occurred in 1700, and one recent study calculated there is a 15 to 20 percent chance that another one will occur in the next 50 years off the central and northern Oregon Coast. Though considerably less likely, an earthquake of magnitude 6.8 epicentered in Portland’s West Hills would be even more catastrophic locally — causing more than twice the casualties and damages — according to the Oregon Department of Geology and Mineral Industries study. State geologists plan to release a second phase of their study next year, charting the potential impacts to Columbia County and Clark County, Wash., to the north of the tri-county region. Mark Miller and Geoff Pursinger contributed to this report. Safe drinking water is our top priority. Your drinking water will be monitored and protected, from source to tap. Design and construction of the Willamette Water Supply Program project is currently underway! Want all the latest news and information? Make sure you are signed up for all three Program updates. Developing the new Willamette water source will take over a decade.